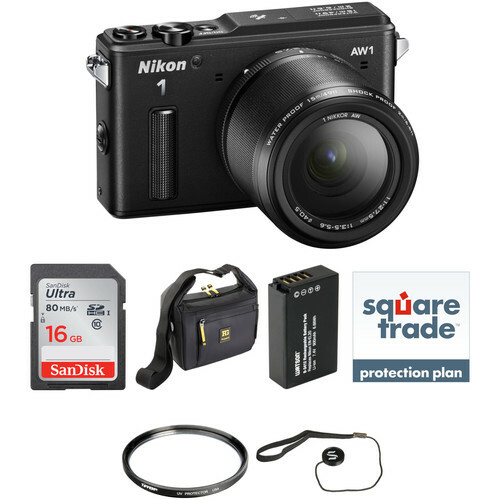 The black Nikon 1 AW1 Mirrorless Digital Camera Deluxe Accessory Kit with 11-27.5mm Lens from B&H combines the compact and rugged 1 AW1 mirrorless camera with a versatile zoom lens and a bevy of accessories to get you shooting immediately and to protect your camera for the long haul. The kit includes a 16GB SDHC UHS-I memory card for high speed image storage and transfer, an extra Li-ion battery for extended shooting times, a compact shoulder bag for mirrorless cameras and their accessories and a 40.5mm Digital HD UV filter to protect your lens and minimize the effects of UV light. Also included is a cap keeper to prevent the loss of your lens cap, an 18% Gray Microfiber Cleaning Cloth for overall camera and lens care and a 2-year extended warranty to safeguard your investment. The Nikon 1 AW1 Mirrorless Digital Camera is designed specifically for use in harsh conditions and for underwater shooting. Its weather-sealed construction is waterproof to 49.2' and shockproof to withstand falls from up to 6.6'. Other key elements include sealed and lockable compartment covers, underwater color compensation settings, built-in GPS with a wide range of environmental sensing functions, and a dedicated Action control button for intuitive motion-based selection of certain camera settings. The 1 AW1 features a CX-format 14.2MP CMOS sensor and EXPEED 3A image processor to produce high resolution still imagery and full HD video recording with tremendous speed and notable low-light sensitivity to support working with in a wide array of shooting scenarios. Full-resolution continuous shooting is supported up to 60 fps and an advanced hybrid AF system employs both contrast- and phase-detection focusing methods. Full 1080p/i HD video is supported in various frame rates including super slow motion and the availability of manual exposure control allows more refined, personalized filmmaking. A large 3.0" 921k-dot LCD monitor enables bright, clear live view monitoring, image playback, and intuitive menu navigation. Included with the camera body is the black 1 NIKKOR AW 11-27.5mm f/3.5-5.6 lens, which provides a 35mm-equivalent field of view of 30-74mm. The lens feature the same robust, waterproof build as the camera body and integrates aspherical and extra-low dispersion elements to minimize aberrations and a protective glass element for additional security in inclement conditions. Does it save raw files? Yes. it does. I have owned mine for over a year, and am very satisfied with it.